Americans cast ballots across the country Tuesday, giving control of both houses to Republicans for President Barack Obama’s final two years in office. Even though the outcome of some contests remains unknown, Republicans clearly retained their large majority in the House of Representatives and claimed Democratic-held seats in key Senate races. In Colorado, incumbent Democratic Senator Mark Udall was defeated by Republican challenger Cory Gardner. "Tonight we shook up the Senate. 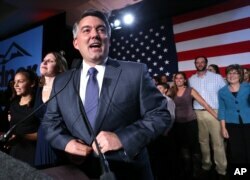 You shook up the Senate," Gardner told supporters. "We go to work to fix a Washington that is out of step, out of touch and out of time." Senator-elect Cory Gardner, a Colorado congressman, delivers his victory speech in Denver Nov. 4, 2014. Tuesday was not a clean sweep for Republicans, as Democrats held onto Senate seats in states such as New Hampshire, where Jeanne Shaheen won another term in office. "I will work with anyone in the Senate – Democrat, Republican, Independent – to get things done," she said. The Senate’s top Republican, Senator Mitch McConnell of Kentucky, will become majority leader in January. He told supporters he hopes to work with Obama, a Democrat, despite ideological differences. "I do not expect the president to wake up tomorrow and view the world any differently than he did this morning. He knows I will not, either," McConnell said. "But we do have an obligation to work together on issues where we can agree." Republicans also retained their majority in the House of Representatives and scored victories in several state governor contests. Many voters said they are disgusted with political gridlock between Democrats and Republicans in Washington. "They have to start doing something," Arizona voter Lee Deremo said of congressional politicians, "and I think it just needs to change, plain and simple." Anger with Washington played heavily in the elections, according to Republican strategist Ford O’Connell: "Two-thirds of America thought the country was going in the wrong direction. They wanted a change in direction. And now it is up to Republicans to bring that change." Tuesday’s vote was a referendum on Obama’s leadership, according to American University professor Allan Lichtman. "President Obama dragged down the Democrats," the political historian said via Skype. "It is not as if Republicans in this election represented grand ideas, inspiring solutions to national problems. They were simply pinning every Democrat [candidate] to an unpopular Democratic president." Reacting to a new political reality in Washington, Obama has invited congressional leaders of both houses and both political parties to the White House Friday.